Spanish developer EnjoyUp games has had a steady stream of titles arrive on Nintendo's digital platforms in recent times, including Darts Up, 99Moves and Rock Zombie, although arguably these games have yet to set the eShop alight. 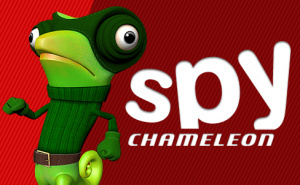 However, this port of Unfinished Pixel's PC game, Spy Chameleon, is probably its best release on the Wii U eShop to date. Spy Chameleon is a stealth puzzler that'll test your reflexes and timing, whilst you strategically plan how to make your way to the exit. You play as an RGB Agent, a spy who happens to be a colour changing chameleon. The game has five missions, each one with a loose objective such as capturing a dangerous creature or taking a photo of a celebrity with her lover; these provide a visual theme (house, laboratory, office, etc.) for each set of levels – of which there are 15 per mission. Completing these missions rewards you with a short but amusing sequence relevant to the objective - with addictive gameplay and subtle charm it's surprisingly fun, albeit with a bit of a mobile-platform feel. 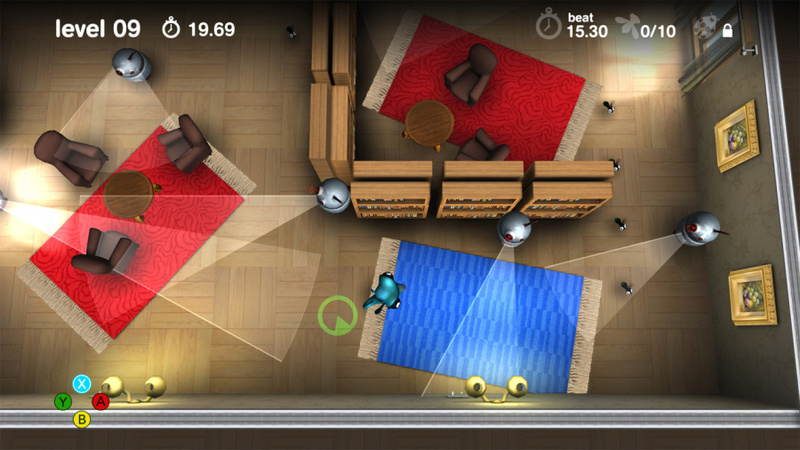 The RGB Agent can change colour from red, green, blue and yellow to blend in with carpets, spilt paint and illuminated floor panels, thus avoiding being detected; you will need to avoid security cameras, robot beams, mice and even fish by moving furniture or operating metal panels to block the beams. Aside from this, you'll need to activate coloured floor panels, 'annoy' fish so that they change their line of sight temporarily, and shuffle around in a cardboard box (think Metal Gear Solid). The title features a top down viewpoint giving you full visibility of the each course's obstacles and enemies. There are three additional challenges per level: collecting 10 flies, beating a set time and collecting up to three 'ladybugs', the latter being unlocked once a level is completed. Although collecting all of the flies in a level is listed as a challenge, you'll actually need to do this a few times on each mission to unlock further levels. At the end of a level you're given the option to replay it or move on to the next one, throwing you back into the action straight away – this makes it very easy to fall into the 'just one more time' mentality. There are separate leaderboards for comparing how you've fared globally and with friends. Each leaderboard can take up to 25 seconds to load, although usually between 10-15 seconds, or occasionally loading up immediately upon completion of a level. This obviously isn't ideal, especially if you're playing in a competitive capacity. Each time you load the game you have to manually activate the leaderboards in order to view them, which may seem an unusual requirement but was probably a deliberate choice from the developer due to the slow load times. Aesthetically it's a bright game with simple visuals, keeping a focus on the set pieces necessary to the puzzle. It looks good in 1080p at 60fps - mostly - although we did experience some slowdown in a couple of levels, but nothing major. The soundtrack is a decent mix of funk, electro and breakbeat, depending upon which mission you're working though, alternating between a particular missions's set of tunes each time you re-enter a level. This keeps things a little more interesting, as the game is fully aware that you'll be revisiting some of these stages more than a few times, especially if you're struggling to beat a time challenge. The controls are tight and responsive, with each colour assigned to A, B, Y, X, matching a SNES controller's coloured buttons. Although the buttons and their respective colours appear onscreen, you'll soon need to memorise them due to the fast-paced switching necessary later in the game. The left stick moves the RGB agent whilst the right stick lets you look around the level, which is particularly useful for collecting the occasionally sneaky ladybugs. The GamePad is only used for off-screen play, making it the only unique feature of the Wii U port. At its most challenging, the game may require you to continually switch between colours to match changing floor panels beneath you - camouflaging yourself from several moving beams, whilst trying to reach the exit. 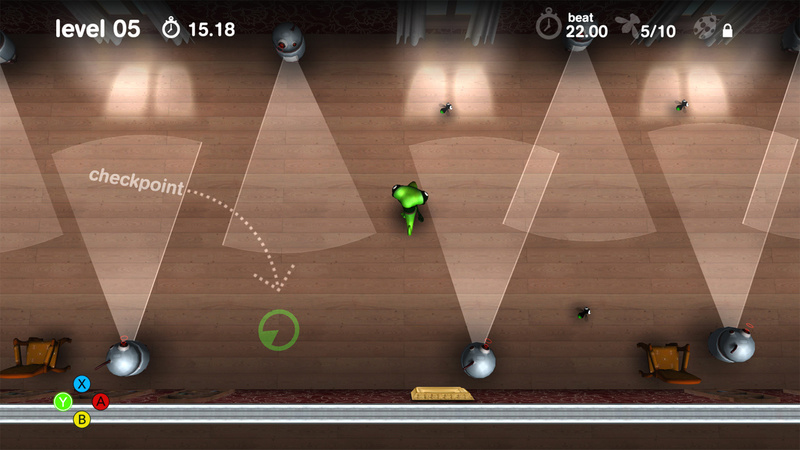 This is as tricky as it sounds; Spy Chameleon certainly keeps you on your toes. Despite this, it's rarely frustrating and most levels will only take one or two tries before you know what you need to do in order to reach the exit. Most levels have handy checkpoints that you'll immediately start again from if you're spotted; each one can be used multiple times, which can be very useful when collecting flies or ladybugs. A normal difficulty campaign lasts around six hours with all challenges completed, which would be a lot less without attempting the challenges; there is also a hard mode featuring exclusive achievements, adding to the title's replayability. 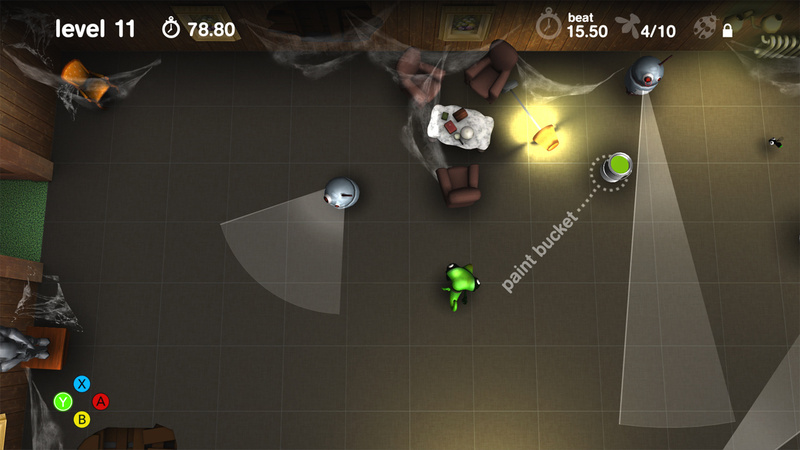 Some achievements can be unlocked by acquiring a certain amount of collectables, clearing all levels without eating any of the surveillance flies and even finishing the game in less than 18 minutes (based on your personal record for each level). 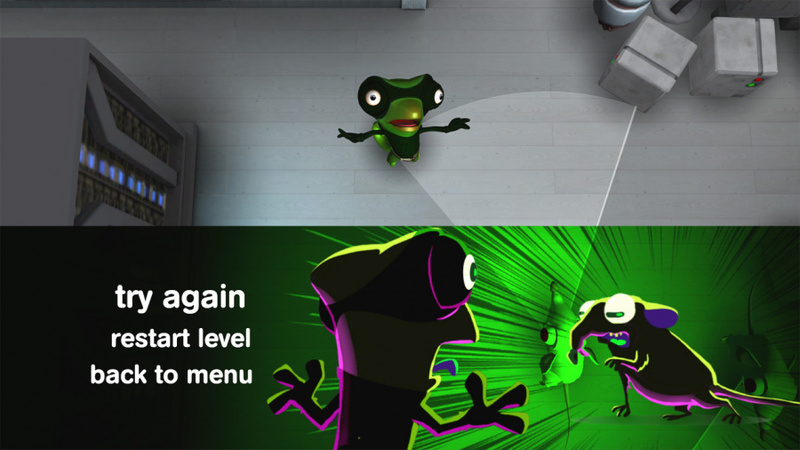 During our time with Spy Chameleon we encountered a couple of minor bugs, such as being able to walk around the outside of a particular level, and receiving an achievement which should only be unlockable in hard mode. Even though none of these are game-breaking, they do detract slightly from the overall experience. Spy Chameleon's focus on challenges is obviously aimed at completionists, who will certainly get the most out of the game. Those who prefer to reach a level's exit and move on to the next one may end up feeling a little short-changed, as the challenges make up the bulk of the title's duration. However, the current asking price is extremely reasonable, especially when you consider the amount of replayability and achievements on offer. Spy Chameleon is a lot of fun and, despite some minor technical flaws, would make a great addition to any puzzle fan's eShop collection. Nice! When I watched the eShop trailer, I didn't really know what to think, but as a fellow completionist, this seems to be a rather interesting game, now that I've read the review. Well, if it ever comes to US I will get it. Hopefully colors are clear enough for this color blind to get. I am currently playing the Turbo part of Super Little Acorns 3D Turbo, having completed the normal part when I bought it on 2013. So I enjoy these games with lots of challenges. Great game a lot of fun I beat it and enjoyed it!!! @sinalefa It's been out in the US since CHRISTmas day. I'll be picking this up at some point. That price and quality gameplay will go a long ways for me. Decent game, all family is enjoying it actually, so as they say..."For all ages! ", lol. Seeing as I love stealth focused games I will definitely be giving this one a look! This one certainly flew under my radar... Looks really neat! I beat this game and this review pretty much nails it. Go buy it, peeps! I've been on the fence about this one; mainly due to it not having a preview video. Glad to know its a great title! Thanks. Since the sidebar only showed the European information, I thought it was not in NA yet. Eh, no thanks. I'm not a fan of stealth gameplay. Just got it... this looks like my type of game.